luvzalkemy | "I wonder, by my troth, what thou and I did till we read…" A blog about books and writing, with occasional ramblings about the important things in life. The Bit In Between is the story of two twenty something Australians, Alison and Oliver, who meet in an airport lounge, both on their way back to Melbourne, and share an instant connection despite Alison promptly throwing up on Oliver. The two are likeable enough but when we first meet them, Alison and Oliver are also extremely self -centred and somewhat annoying. Alison follows Oliver to the Solomon Islands on a whim following a few days of fun together, and a funeral, and without seeing her family as planned, making them wait at the train station three times for her to arrive. Oliver’s relationship with his Greek family is explored in some depth in the book. Alison’s is not, and I think this is a pity and a very big gap in the story. Oliver struggles with his writing – it’s hard to believe at times he is a published author – and Alison does not fit in, especially with the other expat women. As Alison’s friendship with Sera develops, she finds ways to use her skills to help local women and her own confidence and outlook grow as a result. Conflict arises in the relationship as Alison gains more confidence and Oliver’s writing seems to impact more and more on their lives together. Both of them mature a lot as the story progresses and by the end of the book the reader has more respect and affection for them. The minor characters in the book are interesting, complex and sometimes hilarious. The Bit In Between is a terrific book. It really nails the restless search for identity and place by young Australians abroad and its portrait of the Solomon Islands is warm and insightful. I recognise so many of the characters from my own travels and Alison’s stumbling efforts to forge her own identity and find something meaningful, reminds me – somewhat uncomfortably – of myself at that age. The dialogue is spot-on and quite often very funny. I really enjoyed the back stories of people Alison meets, sometimes only in passing. Each of the characters comes across as very real. It is a pity that the book is being promoted as a romance for twenty-something readers. While the relationship between Alison and Oliver is central to the story, the themes of the book – identity, family, relationships and culture – deserve a wide audience and I feel that potential readers who would enjoy the book may be put off by that narrow marketing focus. I feel the weakest part of the book is the ending. The book finishes quickly and in a way that supports the romance focus and it seems, to me at least, as if it is not entirely true to the rest of the book. Unlike Oliver, I’m not against happy endings. It’s just that this one seems a little more forced than the book and the characters’ increasing depth would suggest. It’s fascinating to read a book set in the Solomon Islands, one of our close neighbours, especially by an author with such experience and affection for the country. 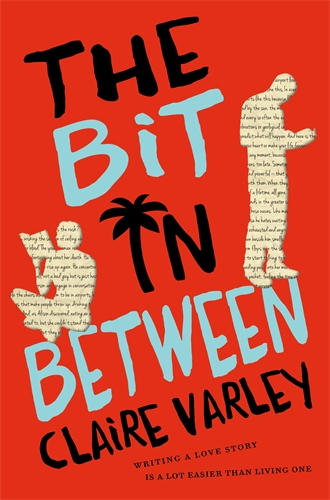 The Bit In Between is Claire Varley’s first book, hard to believe as she has such a strong writing voice. I look forward to her next one. Claire Varley grew up on the Bellarine Peninsula and now lives in Melbourne. She has taught English in China and coordinated community development programs in the Solomon Islands. She has drawn on these experiences, and her Greek Cypriot heritage, in the book. Thank you to Pan Macmillan for providing a review copy. The book is available in your local bookshop now. Today we are discussing the first 149 pages of Lifesaving for Beginners just published by Hodder and Stoughton and released by Hachette Australia. Next Monday (18 February) will be pages 150 – 296 and the following Monday (25 February) will finish the book – pages 297 – 438. It’s hard to say too much about the book without a major spoiler but it is told from the point of view of Milo, a ten year old boy in Brighton and Kat, a 39 year old woman in Dublin. “Just one day can change your life” says the blurb on the cover and that’s true in the story. Carefully organised lives unravel and secrets put aside many years ago come back to the surface and must be faced. I’m enjoying it so far and it’s a struggle to stop at page 149. I’m keen to see how things play out. The daughter of Christian missionaries, Kate James spent a good part of her childhood and early teens in south India, and she continues to visit India regularly when time and money allow. When Gods Collide: An unbeliever’s pilgrimage along India’s Coromandel Coast is Kate’s account of her journey to India to find out more about the murder ten years earlier of Christian missionary Graham Staines and his two young sons. She had always thought of India as a place tolerant of different religions, and so she also wants to know how religious sentiment is changing in India. Having rejected the faith of her extended family as an adult, she is still bound on many levels to those she calls “my people”. It is not entirely clear until the end of the book exactly why the murder raises so many strong emotions in Kate and her motivations become clearer, to herself and also to the reader, as the story unfolds. Along the way she visits her old school, an ashram, temples, and a hospital. The people she meets have their own stories and insights to share. Kate tells a journalist that she is always happy in Singapore, no matter in which direction she’s travelling, because it means she is on her way home. It’s a comment that sums up her life in a way as someone who has lived between countries and cultures. My favourite chapter is the last one when she comes home to Melbourne. Her dogs lick her face and cry with happiness when they see her again – “of course, they also do that when I come home from a five minute trip to the milk bar.” It’s autumn, the best time of year in Melbourne and a trip to the bustling Preston Market – with the Vietnamese woman who sells Kate her fish, Shane the butcher, the Italian owner of Placido’s Coffee – makes her think “maybe these are my people”. This is an incredibly honest book. Kate shares her uncertainties, questioning and insecurities in a very open way. I suspect the journey Kate James is on is not over yet. I very much enjoyed this book and I hope to read more the next time she takes to the open road.